Subscribe today to NSI’s Security NewsWatch! Every week NSI's Security NewsWatch briefs you on security trends, technologies, best practices, legislation and critical issues that face you, the corporate and government security professional. The most significant developments affecting your security program in one quick-reading roundup. Find out about the latest security threats to your information assets, personnel and facilities. Get the latest updates on computer viruses, homeland security advisories cybercrime incidents. Each issue brings news summaries and links to more information on vital issues of concern to help security professionals stay one step ahead of ever-changing threats. 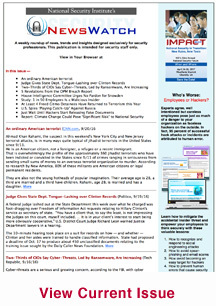 This weekly e-newsletter is provided to you free of charge by the National Security Institute as a professional courtesy.